Seriously, Where’s the Globe’s Wayne Woodlief Obit? As the hardtsking staff has previously noted, the Boston Globe, for reasons known only to itself, has failed to run an obituary for the Boston Herald’s redoubtable Wayne Woodlief, who died on August 12. 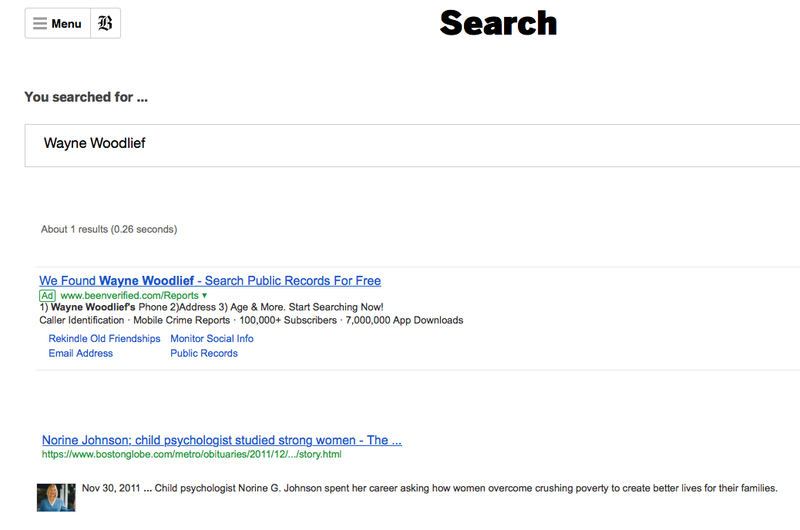 Plug his name into the Globe search engine and you get this. That one link leads to a 2011 Globe obit for Wayne’s late wife, Norine G. Johnson. But nothing for him. Coincidentally, today’s Herald features this item. A memorial service to celebrate the life and memory of former Boston Herald columnist and political reporter Wayne Woodlief will be held Sept. 23 at 11 a.m. at Mount Auburn Cemetery in Cambridge. A reception will follow at a location to be announced. 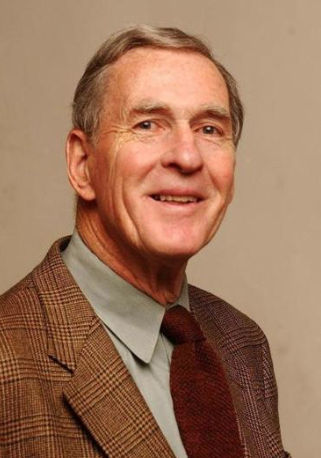 Mr. Woodlief died Aug. 12 at the age of 82. Maybe by then the Globe will have done the right thing and run a proper remembrance of a fellow journalist. 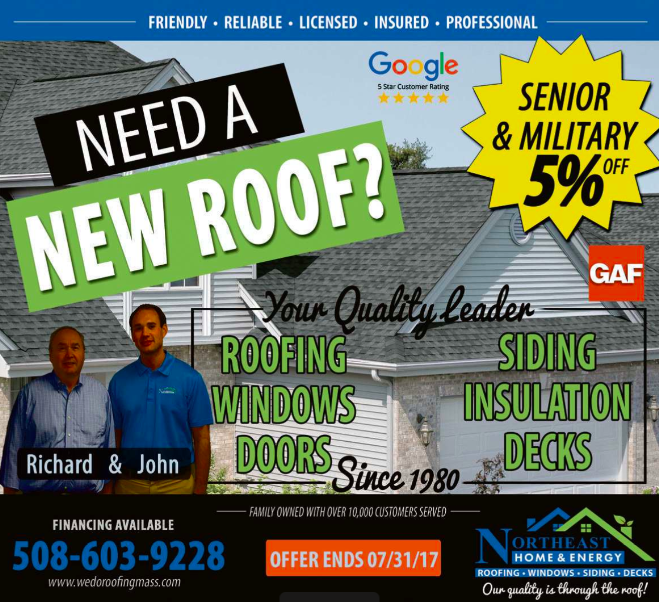 As the hardtsking staff has extensively noted, for several weeks the Boston Globe has let an outfit called Northeast Home & Energy run this ad suggesting the roofing company has some association with the New England Patriots. Except it doesn’t – a fact that Emily Rooney at WGBH’s Beat the Press passed along on Friday’s edition (around 5:15 of clip). 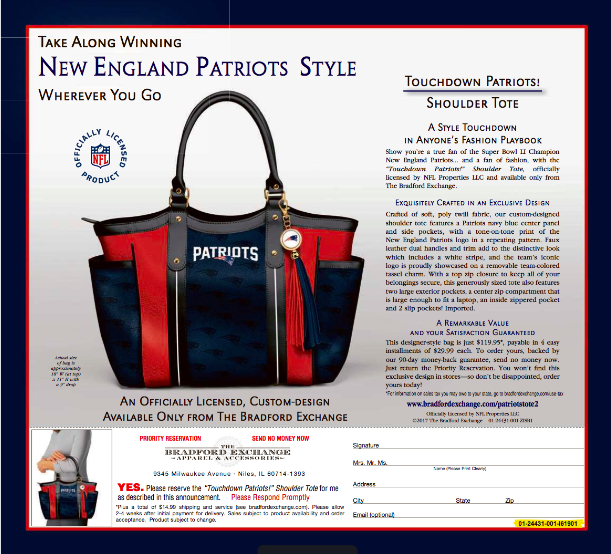 The upshot: The Pats sent a cease-and-desist letter to the Roof Bros, and here’s what appeared in the Globe yesterday and today. No Patriots jerseys. No football. No Gillette Stadium. No consequences for the Roof Bros or the $tately local broadsheet? As the hardreading staff perused Saturday’s local dailies, we came across this ad on page 3 of the Boston Globe. 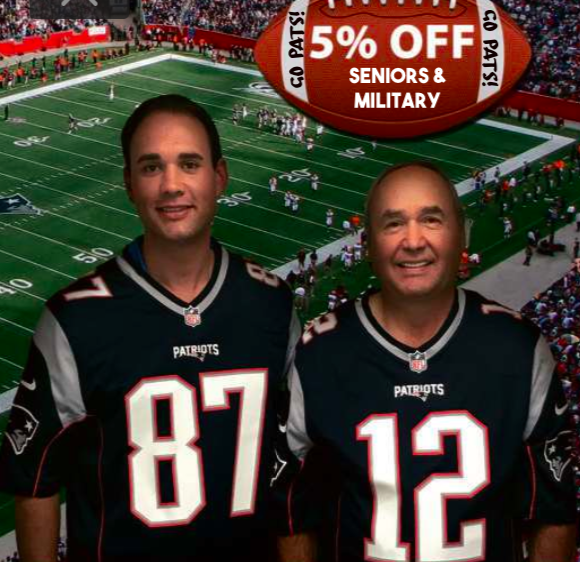 Upon closer inspection, we noted the wardrobe choices of the Roof Bros.
There’s nothing in the ad that indicates any affiliation between Northeast Home & Energy and the New England Patriots. 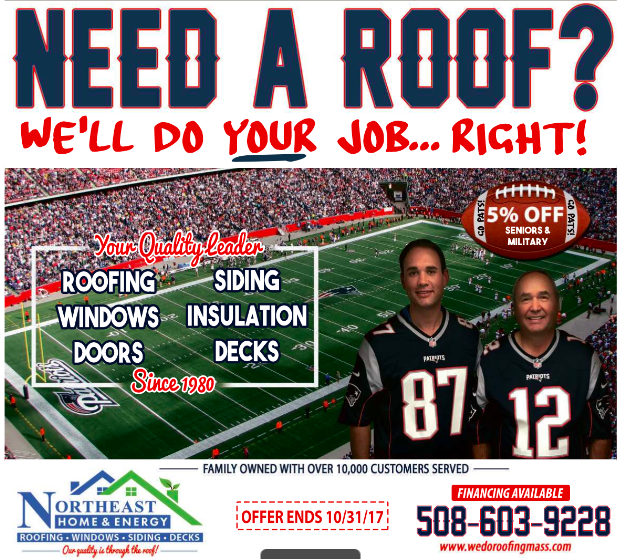 Nor is there any mention of the Roof Bros when you plug NE Patriots Official Roofers into the Googletron. It’s not like the Globe doesn’t know what’s kosher – this ad for an Officially Licensed Product ran in yesterday’s edition. Burlington Red Socks? Celtic sweaters? Bruin Brew? Seriously, are you willing to let anyone with a certified check hijack the local sports teams? P.S. The ad also appears in today’s Globe. You are currently browsing the It's Good to Live in a Two-Daily Town blog archives for August, 2017.